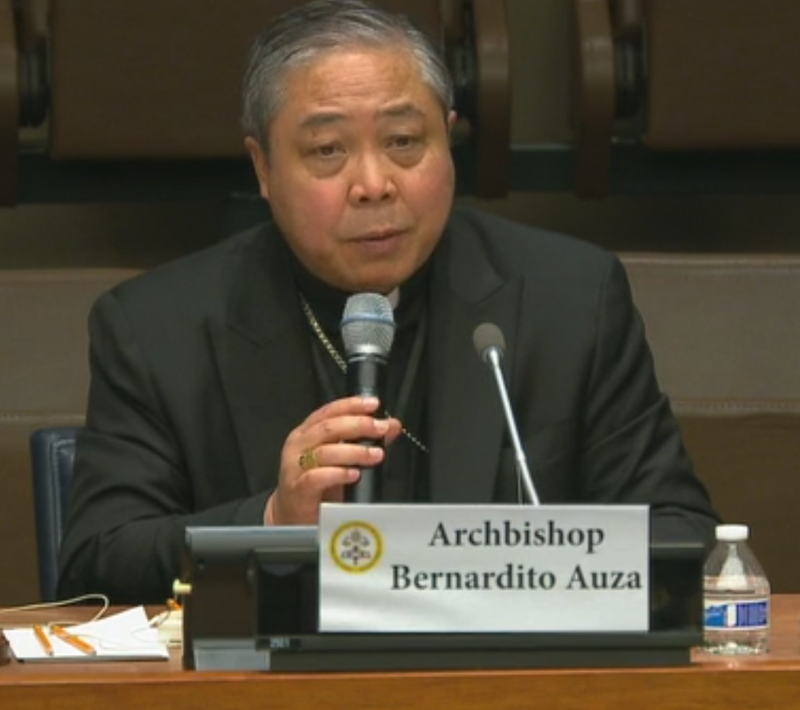 Archbishop Bernardito Auza, Permanent Observer of the Holy See to the United Nations, on June 4, 2018, praised the new draft of the Global Compact for Safe, Orderly and Regular Migration for noting the need for the international community and national governments to cooperate and partner with faith-based organizations (FBOs) whose work is already essential in the care for those on the move and will be fundamental to the implementation of the GCM. they have huge volunteer networks to scale to meet the need and help with cultural and social integration. FBOs, he said, are particularly effective in acting on the four verbs regularly mentioned by Pope Francis — welcoming, protecting, promoting and integrating migrants — and stand ready to partner and collaborate with governments and civil society institutions to assist people on the move, particularly those most vulnerable. I am very happy to participate in this afternoon’s important side-event on the protection and integration of migrants in vulnerable situations and to join the Permanent Mission of Guatemala and the Scalabrinian International Migration Network in shining a spotlight on the work of faith-based organizations in helping to provide that protection and integration. I was pleased to see that in the recently released second draft revision of the Global Compact for Safe, Orderly and Regular Migration, the crucial role played by faith-based organizations was underlined in Paragraph 43, where the international community intends to commit itself to implementing the Global Compact “in cooperation and partnership with migrants, civil society, … faith-based organizations” and several other key stakeholders who are essential to the efforts on the ground and whose cooperation is fundamental to implementing the Global Compact. Faith-based organizations are unique in their reach and presence at all points of the migratory journey, often filling gaps in services to migrants that governments and other civil society actors are unable or unwilling to fill on their own. They are on the front lines in protecting migrants’ human rights and dignity, and in providing food, shelter, education, medical and psychological support, and so much more. There are several reasons why faith-based organizations are highly effective in caring for the millions on the move. First, many faith-based organizations have a well-established footprint across the world, merging local programs with international support, providing highly qualified staff, great local know-how and resources. They have the wherewithal and readiness to mobilize what’s needed to fill in the gaps, many throughout the migratory journey. Second, migrants of particular faiths have a special trust for their faith institutions and sometimes well before they are able to access services provided by governments and international organizations come to the churches and charities of their faith tradition for basic needs support. Eighty-four percent of people self-identify as belonging to a religious group and when they are able to connect with members of their faith, it can help mollify the sense of fear and of being alone. They trust that their religious leaders and fellow believers would not lead them into harm. Even when one is of a different faith, however, many know of the reputation of faith-based organizations to extend care to anyone in need because of the principles of charity, mercy, and solidarity flowing from that faith. Third, faith-based organizations are similarly trusted and respected by governments and other stakeholders, which allows them to play an important bridge-building role with affected persons. They are similarly effective at sensitizing governments, service providers and other stakeholders to the needs of migrants. Faith-based organizations start, not from political or economic perspectives, but from the affirmation of the human dignity of all people before all else. This person-centered approach, while not unique to faith-based organizations, is at the heart of all of their work and can and often does inspire a more holistic approach more generally. and separated children, pregnant women and young girls, elderly and people with disabilities, and those who have been trafficked. Lastly, faith-based organizations have huge volunteer networks to rely upon to help scale to meet the need. Many faith-based organizations arrange for migrants to stay in private homes and begin to access extensive networks to help them get on their feet. Faith-based organizations can provide an important cultural and social-support network of solidarity to new migrants far from home. faith-based outreaches across regions and even the globe. I am confident that faith-based organizations are very willing to partner and collaborate with Government and other civil society institutions to provide the services to assist people on the move, most especially those in very vulnerable situations. Thank you very much for your attendance today.